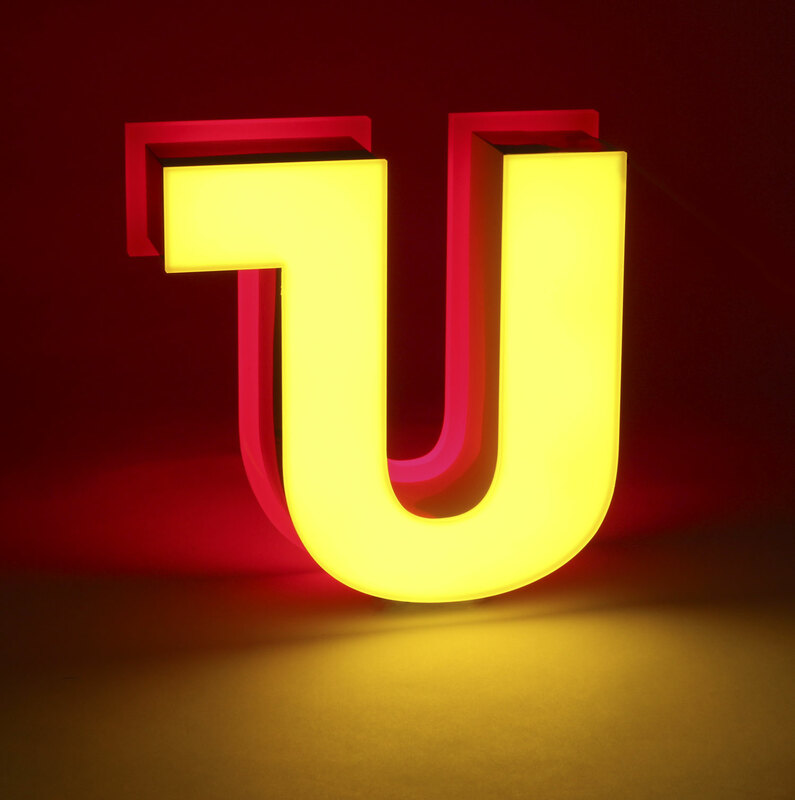 Increased Profitability – In addition to selling these attractive, high quality letters for a premium, customers will also save money by eliminating the labor and material required by the trim cap process. Unmatched by the competition – LetterForm can only be processed on the Super ChannelBender XP, Super ChannelBender and Eco ChannelBender machines, giving our customers a substantial competitive advantage over other sign companies whose bending machines can only fabricate the simplest, most generic types of channel letters. 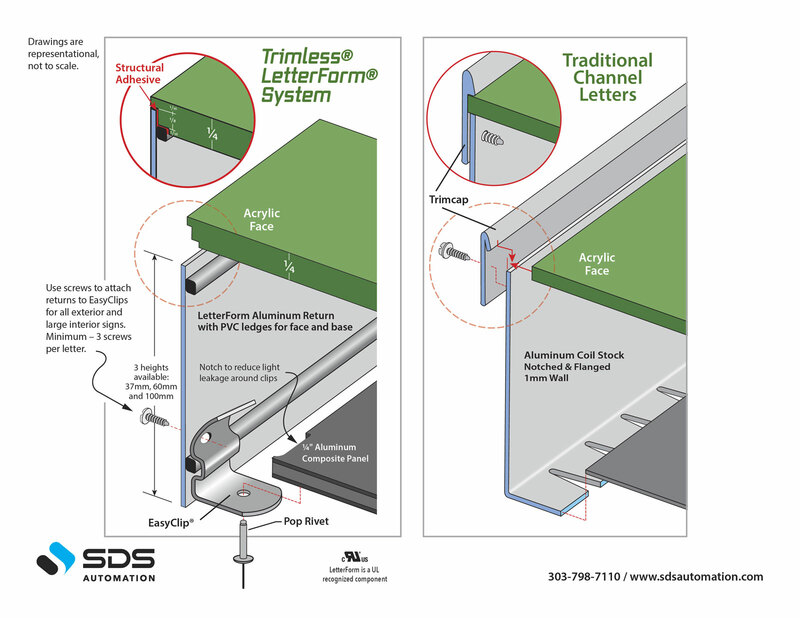 Easier Installation and Repair – Our patented EasyClip® system simplifies installation of LetterForm channel letters. Simply attach the back panel to the wall and snap the face / return assembly onto the EasyClips which are riveted to the back panels. EasyClips are hidden inside the return after assembly is complete. If a letter requires service, rather than removing countless screws, simply snap off the face / return assembly, complete the repair, and snap it back into place. 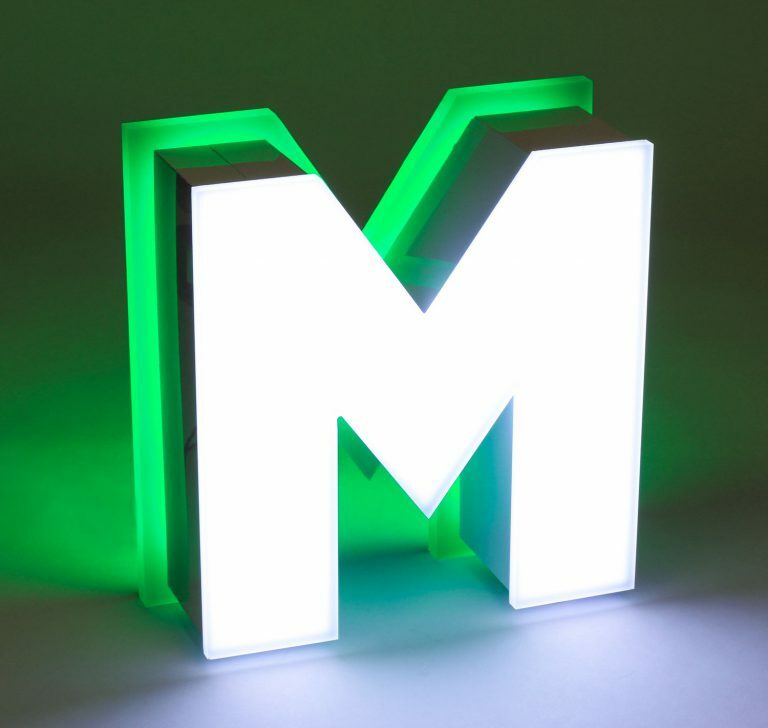 High-Impact Signage – With our return materials available in a variety of heights, LetterForm offers a highly customizable look and the ability to do unique, high-end designs. 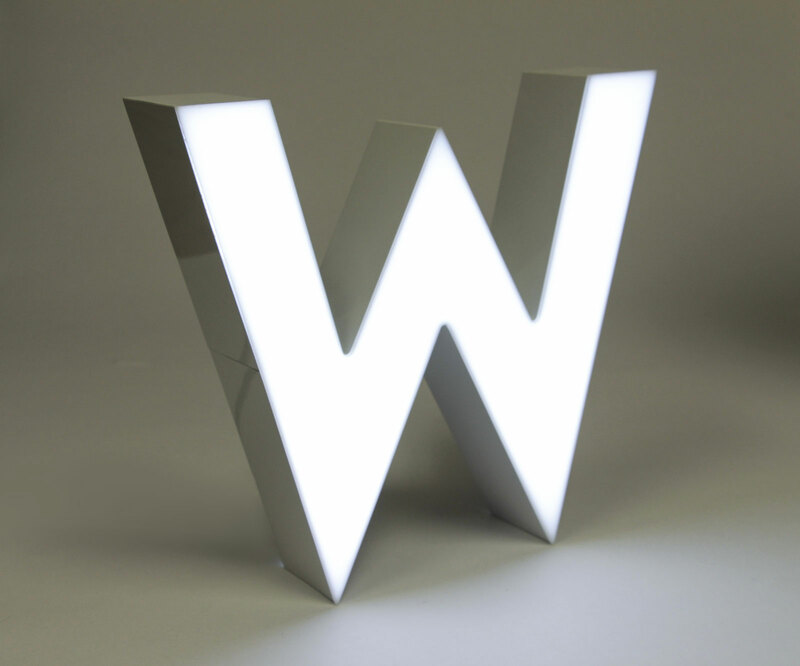 LetterForm is ideal for front-lit, halo-lit, edge-lit and hybrid edge-lit / halo-lit letters. 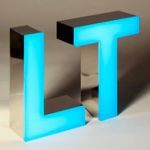 Longer Lasting Signage – While achieving a more attractive appearance, the adhesive sealed Trimless technology eliminates the unsightly, weak link in the chain which is trim cap. Trim cap typically fades, cracks and peels after brief exposure to the elements making it necessary to replace the face of the channel letter. 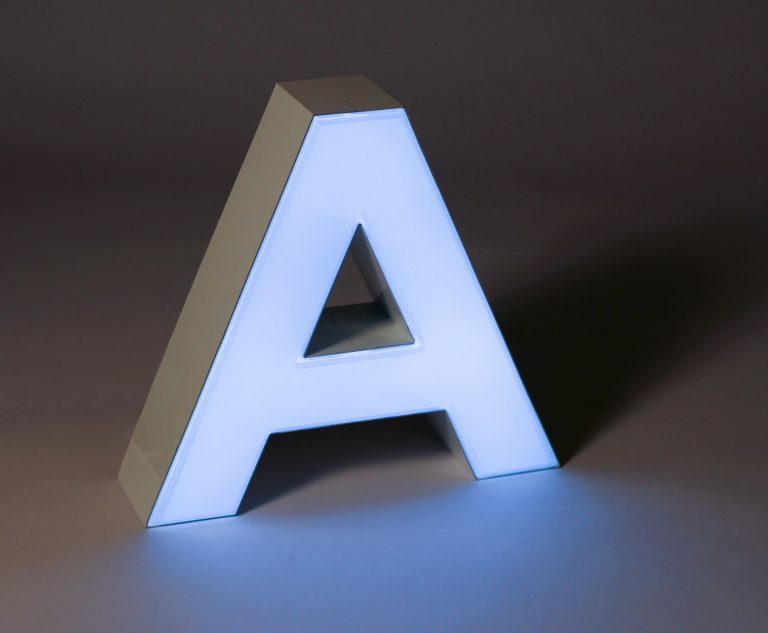 More flexible material – The polymer ridge on LetterForm makes that material more flexible for smaller, more challenging designs. Pre-painted materials – LetterForm comes pre-painted, which saves time and money by eliminating the multi-step prep and painting process. 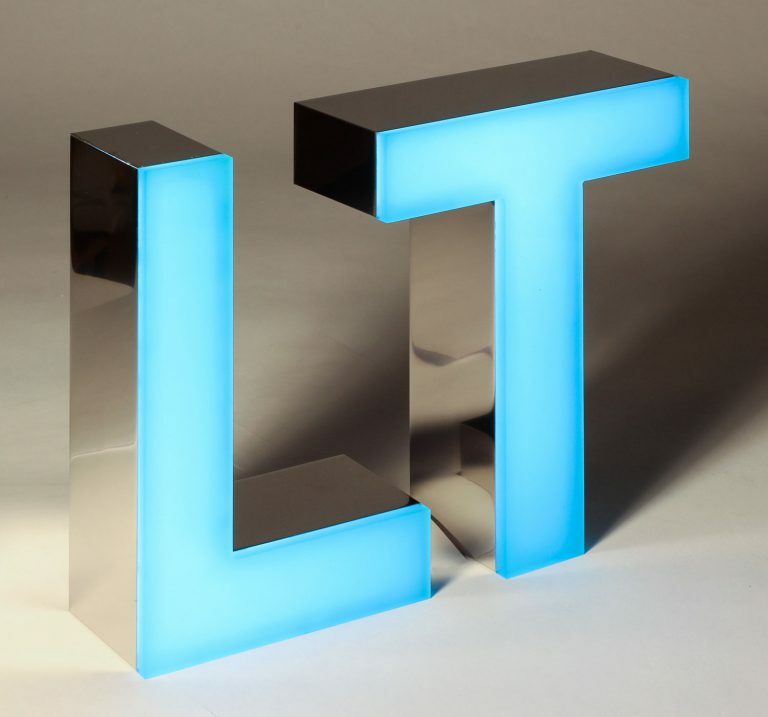 As we expand the number of configurations available in our LetterForm material, options like stainless steel and thicker gauge aluminum, will enable our customers to fabricate an essentially limitless variety of Trimless channel letters. Trimless letters must be limited in size and weight due to the characteristics of the material. Structural integrity can vary due to climate, temperature, surface area, and overall perimeter of the letter. SDS makes no definitive recommendation regarding maximum letter height or weight. 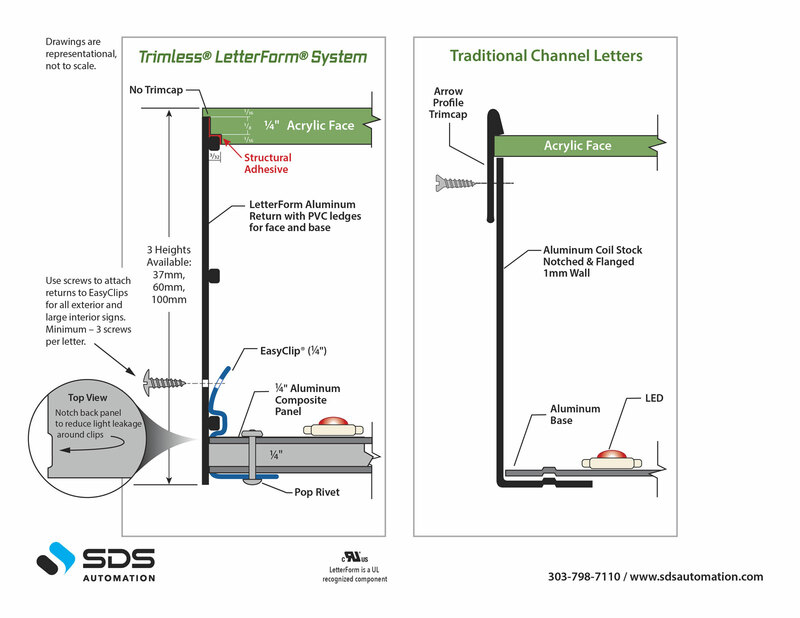 Users may wish to consider not exceeding 30″ in height when fabricating letters with LetterForm coil. Each user is responsible for performing an independent structural integrity evaluation for each application. Learn more about FREE LiquiForm and LetterForm training!